Ten minutes and 39 seconds into the third period and the pressure was on. Celine Whitlinger, the starting goalie for Penn State, reacts to Minnesota closing in on her net. With help from her teammates, Whitlinger stopped 41 shots, only allowing two goals. 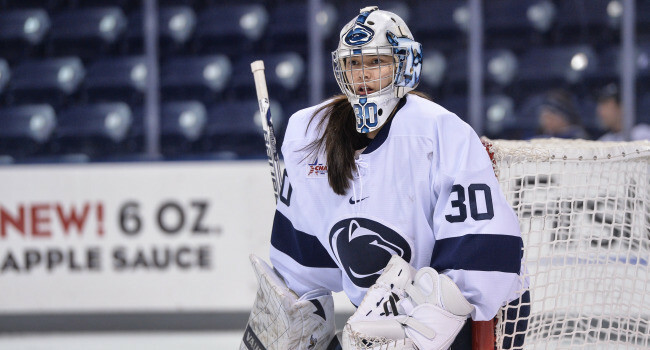 Whitlinger held her poise and demonstrated the confidence needed coming into the home opener against Minnesota, but she failed to keep the momentum needed to block those two goals. Having 41 saves in three periods was impressive for Whitlinger where her average number of saves is 34. Last year, Whitlinger had three shutouts finishing the year as the two-time College Hockey America Goaltender of the Week. Her first win last season at Union resulted in her earning CHA Goaltender of the Week. She also received Goaltender of the Month last December after a 0.50 goal average was recorded and a .987 save percentage was present. Whitlinger was able to earn herself CHA’s Goaltender of the Month again in January after an undefeated 3-0-1 mark in conference play. She had a .955 save percentage and allowed nine goals in 364:05 minutes on ice. Tonight the Nittany Lions will take on the Minnesota Gophers in an attempt to tie the series in their home openers.